In 1998 the World Cat Federation officially recognized the Brazilian Shorthair as the first and so far only Brazilian Recognized Purebred Cat. These distinctive and attractive cats are rapidly gaining fans far from their native land thanks to their silky coats, minimal shedding and affectionate personalities. This writer can attest to these qualities (and more) from personal experience, courtesy of Jean Grey, our neighborhood Brazilian Shorthair. 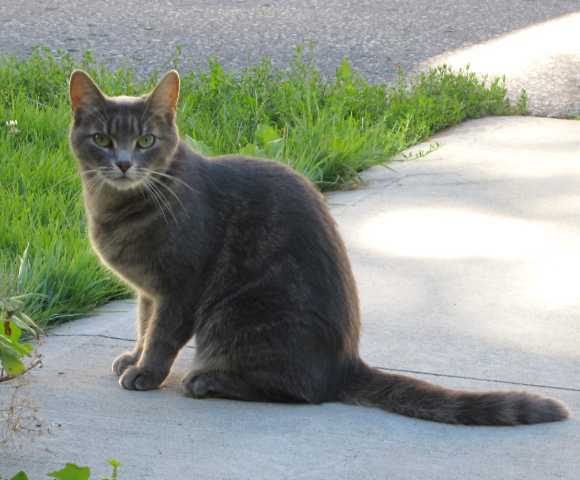 Jean Grey moved into our community a few months ago and she lives just across the path from The White Cat's house. 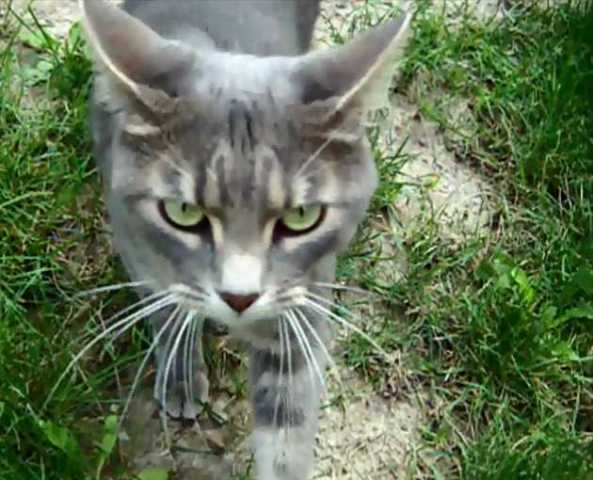 She's one of four cats who now live there; the others being a black & gray American Shorthair, a pale gray Tabby and a caramel & white “cow-cat”. Jean Grey quickly made an impression on me by being so friendly. When I'd walk by, she'd delicately charge out from her sheltered patio or from beneath some shrubbery to greet me with a flurry of meows. On dark evenings I would hear her before I would see her: Jean Grey's keen kitty night vision enables her to somehow recognize me from surprisingly far away! Most greetings are invariably followed by my gently massaging the back of her neck, something she loves. I've read that cats associate having the backs of their necks rubbed with those times when their mothers would pick them up by the scruff of their necks to move them to safety. Doing so – then and now – releases endorphin hormones that help the kitten (or cat) relax. Try it sometime with your fave feline! The first thing I realized the first time I touched Jean Grey was that her fur was amazingly soft and silky – more so than that of any other cat in my experience. When I asked one of the children who lives near Jean Grey what kind of cat she was, she replied “Tabby” but there had to be more than that. When she also told me Jean Grey's owner had brought her mother here to Canada from Brazil, I knew I had a clue to solving the mystery. A quick internet search for “Brazilian Cat” brought up numerable mentions of the Brazilian Shorthair, a relatively new breed of cat only officially recognized as such by the World Cat Federation in 1998. Full credit for this designation and for raising awareness of the Brazilian Shorthair in general must go to Brazilian-born engineer and cat-breeder Paulo Samuel Ruschi, who noticed that the feral and street cats from several cities in Brazil shared a suite of common characteristics refined over 500 years of evolution! Ruschi's research into Brazil's street cats led him back to the early years of the 16th century and the first ship-borne waves of Portuguese colonization. Like the first English and French colonists to North America, Portuguese emigrants to Brazil brought their cats along with them: in addition to controlling rats during the long Atlantic ocean voyages, the cats took up their old habits of rodent control once the colonists' farms provided grain, seeds and beans which had to be stockpiled after harvesting. The difference was that while today's American Shorthair cats originated from northern European farm cats and going further back, European Wildcats, Brazilian Shorthairs are descended from the wild cats of the Iberian Peninsula. Upon arriving in Brazil, the colonists' cats began adapting to local climactic conditions, with many of these adaptations being genetically passed on to their offspring. Centuries of gradual acclimatization have given today's Brazilian Shorthair its salient features including large and pointed ears, a muscular and agile body, and a very short, silky and glossy coat with no undercoat. It's said that people who are allergic to cats note they suffer less when in contact with a Brazilian Shorthair. Other features distinguishing Brazilian Shorthairs are tails that taper slightly, expressive, almond-shaped eyes that usually complement the fur's color, and heads that are longer than they're wide. Males usually have larger heads than females. 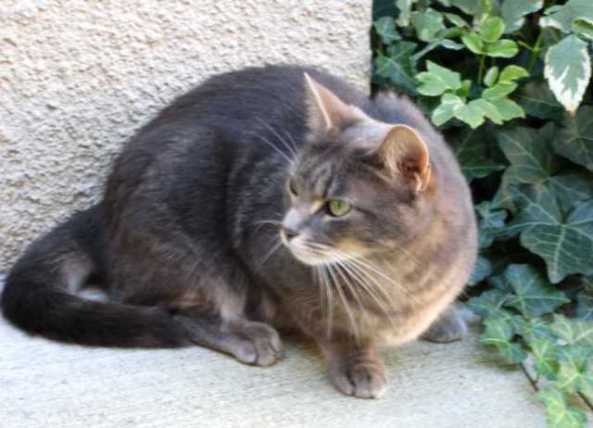 All of the above characteristics are exhibited in abundance by Jean Grey, who perfectly fits the mold of a typical Brazilian Shorthair cat. 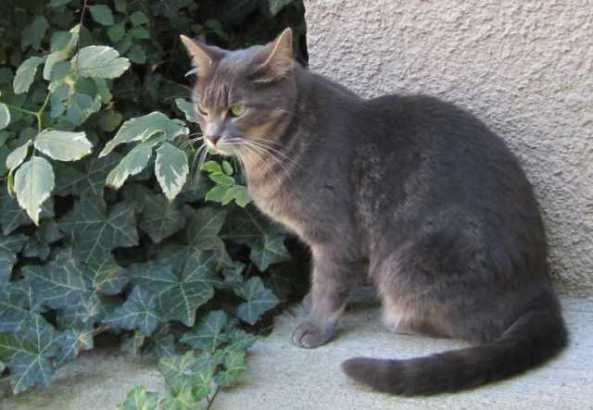 Her coloration (gray-brown fur with subtle striping and jade-green eyes) also matches the breed's profile in that Brazilian Shorthairs can be pretty much any color or combination of colors. That may change as breeders like Mrs. Sylvia Roriz de Carvalho of Cattery Syarte continue to refine the breed. As for her lack of an undercoat, I wonder how Jean Grey and other Brazilian Shorthairs tolerate cold Canadian winters... we have to assume these cats who love to spend so much time outdoors now will stay much closer to home over the coming chillier months. With longstanding prejudices against street and feral cats hindering the appreciation of the new and exciting breed of cat in its native land, Americans considering making a Brazilian Shorthair a member of their family will be pleased to know the United States currently boasts the world's largest population of both Brazilian Shorthair cats and their breeders. If the cat you choose is anything like Jean Grey, I'm sure you and your Brazilian Shorthair will be very happy together! For more online information on Brazilian Shorthair cats, please visit Pet Brazil and Blog About Cats. *** UPDATE: It is with great sadness and the heaviest of hearts that we must report Jean Grey went missing in early September of 2015. We miss her terribly; in the short time we had the privilege of knowing her, Jean Grey brought us much joy and always expressed unconditional love and affection.